This is the place for notices and short news items that will be of interest to members of the DA. You may also wish to look at the Events news page where new events and changes to existing ones are reported. This page will be updated as news comes in – the latest items will always appear at the top. Some of the items are re-posts of content that was originally published in DA News. If you have any Association-related news that you think would be of interest to the membership, please send it to the Registrar: you can use the message form on the Contact page, if you wish. Subject to approval, we will publish it here. The spring 2019 issue of our magazine DA News has just been published. 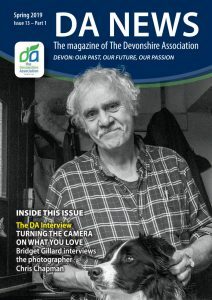 Contents include an interview with the photographer Chris Chapman, reports on the distinctiveness of Launceston (the location of this year’s conference) written by each of our Sections, a history of the song ‘Widecombe Fair’, and much more. All members should have received their copy. Elizabeth Brain retired in 2013 after thirty-six years as Bideford Branch Honorary Secretary, but she remained on the committee and continued as Membership Secretary until her sudden death on January 18th, 2019. She was also an active, dedicated member of Bideford United Reformed Church. We shall all miss her knowledge, her reliable service and her compassion. Our thoughts are with her family who, like me, have lost a special friend. D. J. B. ‘Jim’ Coulter, BSc. From 1993 Jim Coulter was the Chairman, and from time to time also acted as the Hon Secretary, of the North Devon Branch and he continued in the Chair until the Branch closed in 2002. From 1997 Jim was a member of the Committee of the History Section and he served as its Hon Secretary from 1999 until 2001. Jim was elected to serve as Vice-Chairman of the Association’s Council, as it then was, between 1999 and 2000 and again between 2001 and 2002, on both occasions under the Chairmanship of Bruce Peeke, at the time when the problems over Bowhill and its unsuitability as our Head Quarters became apparent and were at their height. He will be best remembered for taking the lead at the time in the negotiations with English Heritage which lead eventually to the Association successfully surrendering the residue its Lease and enabling a move to smaller and more suitable office premises in Longbrook Street in 2004. Council is pleased to report that since the last Annual Meeting agreement has been reached with the Regional Office of English Heritage on the terms to be recommended to the Secretary of State in order for the Association to be released from its lease of Bowhill. A major part in reaching this agreement over a prolonged period was played by Mr Jim Coulter and Council is most appreciative of all the time and work he has put into this. 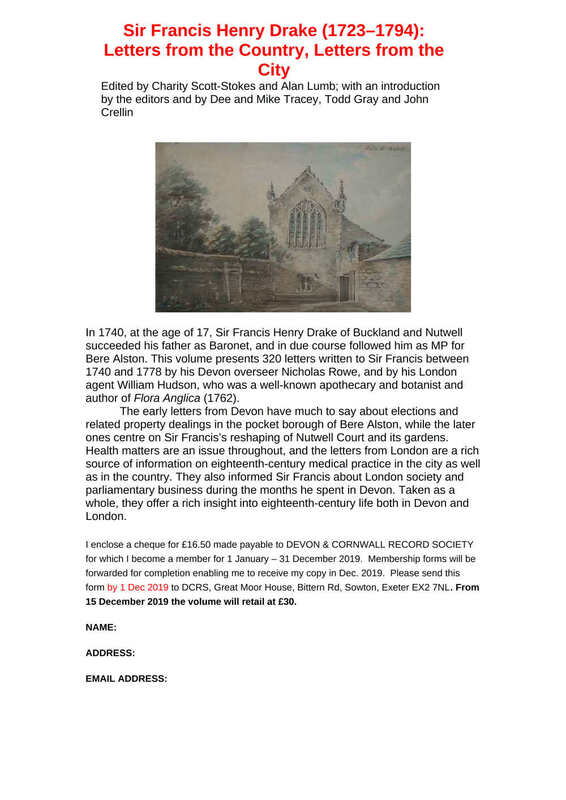 The Devon and Cornwall Record Society announces its 2019 publication, Sir Francis Henry Drake (1723–1794): Letters from the Country, Letters from the City. To be published in December, it is the culmination of a collaborative project that was launched by our History Section. Available to members of the DCRS as part of the annual subscription of £16.50. After 15 December 2019 the volume will retail for £30. Click on the image to the right to see the flyer and application form that can be printed out. Our Industrial Archaeology Section has just published its fourth newsletter. Items packed into its 20 pages include a report on last years AIA conference in Nottingham, a report on the Section’s visit to Hayle (including Wheal Bassett), and reports on talks given to the Section about the laying of the early Atlantic telegraph cables and the work of a stonemason (Beer Quarry to Exeter Cathedral). There are also articles on the water-powered sawmill at Simonsbath and the resurrection of a stationary engine. You can read the newsletter here. Last year, our History Section and the Devon History Society jointly founded a project to encourage new investigations into Devon’s place-names. A short update can be read on the project’s webpage, here. If you are interested in contributing, contact details are on the project page. 2018 Transactions is in the post! Full members of the Association should receive their copy of this year’s Transactions shortly. Those not lucky enough to be able to read the publication can see an overview of its contents here. If you would like to ensure that you receive next year’s volume, you can join us by downloading and completing an application form from the membership page. 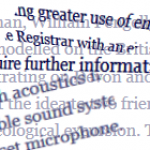 The abstracts for the papers in our 150th volume of Transactions are now available, see here. The volume is due to be published before the end the year, and we have a special membership offer to celebrate this event – see the item below. From now to the end of the year* we are running a special membership offer to celebrate the publication of the 150th volume of our Report and Transactions. See the offer page for full details. * Or until all available applications are filled. The autumn 2018 issue of our magazine DA News has just been published. It has been thoroughly revised by a team led by chief editor Dr Bridget Gillard, our Registrar, and it is the first issue to be produced in full colour. All members should have received their copy. After a bit of a summer break, we have started to add content to this website again. Under Devon there are transcriptions of two old but still interesting papers: Some Devonshire Field-Names (1913) and On some boulders of pseudo-jasper found near Newton Abbot (1910). We’ve also added a 1920 biography of DA’s first president Sir John Bowring, written by William Pengelly’s daughter. To follow current internet best practice, we have today made this entire website only accessible over the secure HTTPS protocol. There are several advantages in doing this and, as far as we are aware, no significant downsides. Our 2019 Conference will be held in Launceston, one of the rare occasions when we hold it outside our home county, and exactly 110 years since we last met there. The opening day will be Friday 31 May, the AGM will be held on Saturday 1 June, and Sunday will be set aside for excursions as usual. The president-elect is Mr John Allan, BA, MPhil, FSA. [The Spring 2018 edition of DA News was] the last under Brendan Hurley’s able editorship. We are hugely grateful to him for all he has done to curate and improve DA News over the last few years as it has continued to evolve to become ever more attractive and an indispensable vehicle for communication about the Association. In view of the increasing importance of digital communication and the success of our new DA website developed by our webmaster John Maltby, the Executive Committee (ExCo) has created an editorial board to ensure smooth interaction between the website and DA News. Alongside John, the board’s membership is Sue Andrew our vice chair, Tony Buller our Publicity Officer, and Bridget Gillard our Registrar. The Executive has further agreed to appoint Bridget as editor in chief of DA News because the Registrar is at the centre of our communications network; this is another enhancement of the Registrar’s role and we look forward to the further development of DA News under her editorship. At the same time, the Committee has also agreed to Tony Buller continuing as our Publicity Officer after his term as an elected member of ExCo ends at the forthcoming AGM [Dartmouth 2018]. He will continue to attend the Executive Committee and play a full role in our affairs. We are most grateful to him for agreeing to do this – his indefatigable energy and commitment to the Association are invaluable assets which we have come to appreciate and rely on. For easier access to each Branch’s and Section’s list of forthcoming events we have added shortcuts to the Events page. The Association regrets to hear of the sudden death of Susan Hateley, long time member of our Bideford Branch and the Branch Committee until 2016. Her work and enthusiasm for the DA was greatly appreciated and will be sadly missed. Susan graduated in Botany and Plant Biology at Hull University and followed a teaching career at the former Edgehill College, Bideford until retirement. She was also a former member and competitor with Devon Orienteering – their appreciation of her life can be read on their website here. The Association is very sorry to hear of the recent death of Alasdair Barclay – he was a DA member since 1995 and the Vice Chair of the Bideford Branch. He had also been an active and committed member of Torridge District Council. We send our condolences to his family. We have just added new reviews written by our Chairman, Peter Beacham OBE, of two recent books on James Ravilious. One book contains high quality reproductions of 75 of his photographs, the other is an insightful biography by his widow. Read the reviews here. 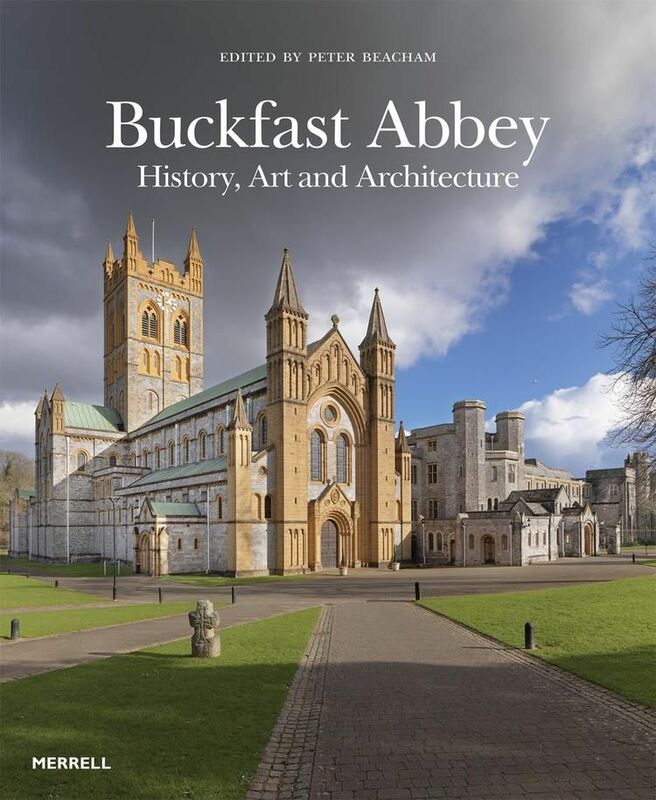 Buckfast Abbey celebrates its millennium in 2018 and our chairman, Peter Beacham OBE, is the editor of a new book, ‘Buckfast Abbey, History, Art and Architecture’. A conference to launch the new book was held on 7 October 2017 at which contributors to the publication spoke on their particular subject area. 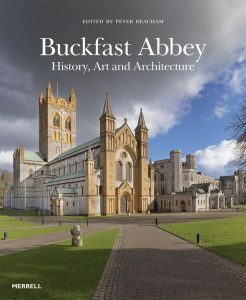 The book is now available in bookshops, price £60. From today the @devonassoc Twitter account will be used in conjunction with this website to provide updates on what the DA is doing. We recommend that all Twitter users should subscribe as another way of staying up-to-date with events in the DA. An icon that links to this feed appears in the green footer at the bottom of every page. Our Registrar has a Twitter account @DA_Registrar on which she posts and retweets a daily eclectic mix of Devon-related items including details of selected upcoming events. We have a few other Twitter feeds too: @DABotany, @DABuildings and @DaGeology which are mainly for members of those Sections (though anyone can subscribe, of course). 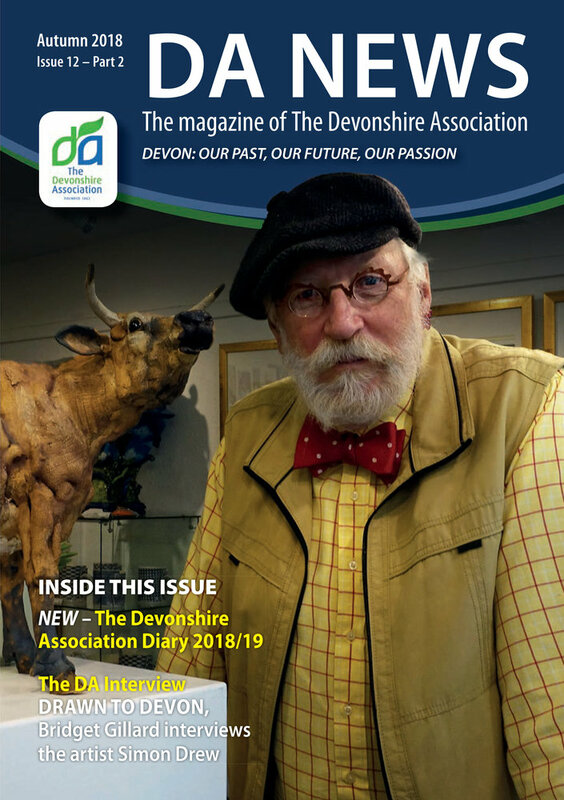 Dr Chris Cornford, President of the Devonshire Association in 2014-15, died peacefully in the early hours of Saturday 4th November at his home in North Devon. Over the past two years he had fought cancer with courage and dignity, remaining positive until the end. Following some years working as a petroleum geochemist, in 1983, he set up Integrated Geochemical Interpretation Ltd and a Field Centre at Hallsannery, near Bideford. His company, which provided services to the oil and gas industry with an emphasis on integrating geochemistry, geology and basin modelling, was internationally recognised as a leader in its field. He was a strong supporter of the Devonshire Association and, together with his wife Sally, was active in many other societies and organisations in Bideford, Devon and South-West England. A service of celebration will be held at 1.40 pm on Monday 20th November at Barnstaple Crematorium and afterwards at Hallsannery. A full obituary of Chris will be published in next year’s Transactions. 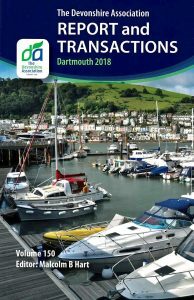 The 156th DA Conference will be held over three days, commencing Friday 1 June 2018, at The Royal Castle Hotel in Dartmouth. The lectures and AGM will be held at the nearby Flavel Centre. Further details will be published as soon as they are available. 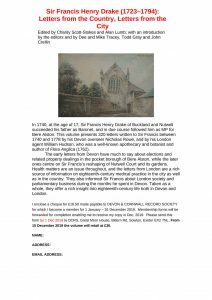 Two Branch reports of this year’s events have recently been added: East Devon’s includes talks on rood screens and life in medieval Exeter, and a visit to Forde Abbey in Dorset; while Exeter’s covers talks on General Mercer and Harry Hems, and visits to a Freemason’s Hall, the estate of Hall, and Northernhay Gardens. Comments were requested in the Spring issue of DA News about the future format of the Report and Transactions. Following an analysis of the 55 responses received from the membership, it has been agreed that, from Volume 150 (2018), the Report and Transactions of the Devonshire Association will continue in almost the present format (though with redesigned cover). There was a clear view that we concentrate on original papers/articles and retain the reports (though with revised guidance provided for those compiling the contents). Issues where members’ guidance was mixed, and which require decisions to be taken by the Executive Committee, are the presence of financial data, book reviews and obituaries. There are quite compelling reasons for both leaving in, or taking out, and we still have to assess the merits of some things appearing on the website or in DA News. Our President, David Fursdon, recently received a Lifetime Achievement Award, which was presented to him on the eve of the Devon County Show, in recognition of his major contribution to the agricultural industry. In the foreseeable future the Association will be making greater use of email to communicate with our members. We encourage those who have not yet provided Bridget Gillard, our Registrar with an email address to do so. Also if you have changed your email address or any other contact details, please let Bridget know. South Devon Branch has posted its latest Branch report, including details of talks on church houses, the Royal Clarence Hotel fire, Devon place-names, and walks around Ashburton and Dawlish. The Association is very sorry to hear of the death of Jeanne Edyvean, our Registrar from 1971 to 1989 and sends condolences to her family. Having had difficulty with acoustics in some village hall venues, the Industrial Archaeology Section has recently purchased a small portable sound system. The unit is powered by a rechargeable battery and is provided with a lapel microphone and a headset microphone. Both of these operate wirelessly so there are no trailing wires. The Section has agreed to make the unit available to others in the DA. It will be kept at the DA office and bookings should be made via the Registrar. The Association has recently received two bequests, one for £5,000, the second for £1,000. The Association is most grateful for these generous donations which will be used to further improve our services to members. Art historian and DA Executive member Jenny Pery is the author of a recent book dealing with the portrait painter Andrew Festing. The book, Andrew Festing Face Value is published by Millennium Publishing.